What is Macular Degeneration? It is a progressive condition affecting the central part of the retina (the macula) and resulting in distortion or loss of central vision. Because it usually occurs in older adults, it is often called age-related macular degeneration. 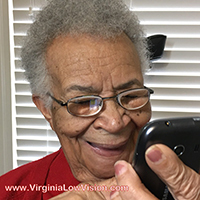 People with macular degeneration experience difficulty with reading, recognizing people's faces, driving and other activities requiring sharp vision. Macular degeneration does not cause total blindness. The peripheral (side) vision is not damaged. Is there a cure for Macular Degeneration? There is currently no cure. When new blood vessels grow beneath the retina resulting in leaking of blood and fluid (wet macular degeneration) injections are often used in hopes of stabilizing the vision loss. People with dry macular degeneration use AREDS2 formula vitamins for the same purpose. How does Macular Degeneration affect a person's life? People with macular degeneration often have to give up activities that are important to them. This can result in a loss of independence and less enjoyment of life. There is an increased incidence of depression among macular degeneration victims. What help is available for my vision? Dr. Armstrong prescribes microscopic and telescopic glasses as well as other devices which help maximize existing vision. 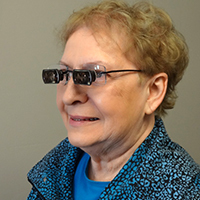 These glasses help people continue reading, driving, recognizing faces, watching television and other activities. They often add independence and enjoyment to a person's life. Will I be able to continue driving with Macular Degeneration? 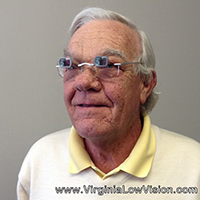 Virginia is one of many states that issue special driver's licenses allowing people with reduced vision to drive while wearing bioptic telescopic glasses. Dr. Armstrong has helped many people continue driving safely and legally. "The loss of independence is huge. You don't realize how confined you are when you can't drive and you have to depend on somebody else. It's quite depressing frankly. It's wonderful to have that life back." "I'm doing just great. I love watching TV and I'm learning to use them for the computer. It's amazing. Thank you very much." "Thank you Dr. Armstrong for helping my aunt. I appreciate you so much for your kindness and giving her the rest of her life where she will be able to see. That is a gift to make her life more enjoyable and productive. The quality of life is so important to all of us and as we get older we see our loved ones who may be struggling with many difficulties.I feel it is up to family and friends to help in whatever way we can. It is a blessing to them but also for the giver. Thank you again." I passed the West Virginia driver's course and I've got my bioptic telescopic driver's permit. It was a good experience. They are very nice people. The lady who went in the car with me never had to use her brakes." "This man is wonderful! 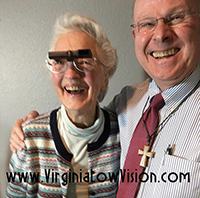 My career is in another optical field where I have had 44 years of experiences with low vision providers and he is by far the best. I took my husband to see Dr. Armstrong this summer and he fit him with distance glasses as well as reading glasses! My husband now enjoys going many places and can accomplish many close up tasks he was unable to do before! Thank you Dr. Armstrong from Julia and John Small, owners of Martinsburg Optical Inc."